Ukiyo-e is a style of Japanese art that came to prominence from the 1600’s to the mid-1800’s. It is commonly known as the Edo Period. It literally means “Pictures of the Floating World.” The technique used colour woodblocks and paintings featuring images of Japanese culture, landscapes and folklore. Much of the West’s initial impressions of Japan came from these depictions. 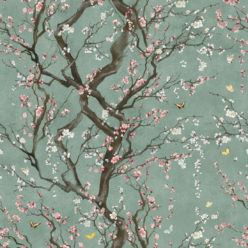 Kingdom Home Design created a Ukiyo-e wallpaper collection inspired by the philosophy that underpins this Japanese artistic phenomena.From flora to fauna, this collection depicts the beauty of Japan.There are six new diverse designs that illustrate the striking beauty of the Ukiyo-e genre. Let’s take a closer look at this new offering from Milton & King. 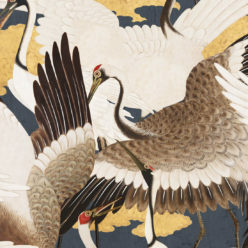 The Japanese method of traditional hand-painting called Byobu (gold silk folding screen) inspired the look of Cranes Wallpaper. This design represents the union of landscape and fauna which is typical in Ukiyo-e art. The Crane is often thought to be the ‘Bird of Happiness’ and good fortune in Japanese culture. It is pictured here soaring regally amongst the gilded clouds.  This design is sold as a set (A/B rolls). 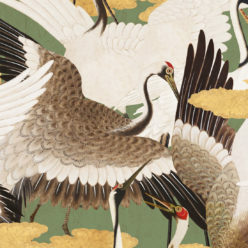 The Crane pattern spans across two drops of wallpaper before repeating. 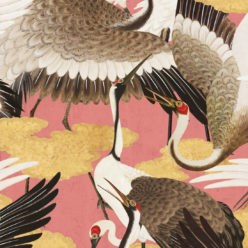 The majestic Cranes Wallpaper is available as traditional paste-the-wall or removable wallpaper. 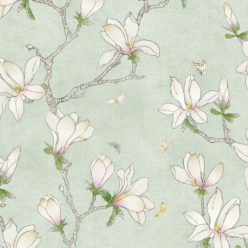 Kingdom Home created a Magnolia Wallpaper as part of the Ukiyo-e collection. Magnolias (朴の木) in Japanese culture are often associated with the concept of life force. Therefore, they are a very popular gift item to offer at births. 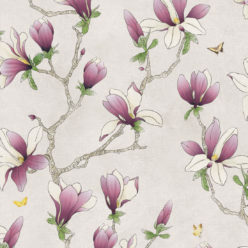 Magnolia blooms also represent a love of nature. 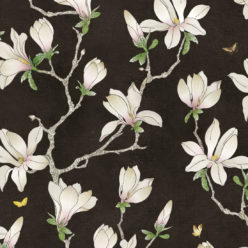 This Japanese wallpaper design captures magnolia flowers in full bloom. Tourists often comment on the beauty of the blooming magnolia flowers in Japan. 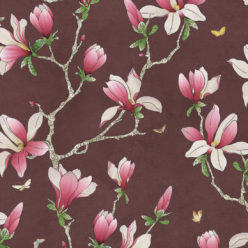 Now, this Ukiyo-e wallpaper encapsulates this beauty in 4 different colourways. 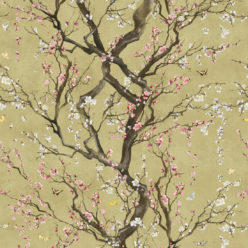 Seasons Wallpaper is the most ambitious and comprehensive homage to the Japanese natural landscape. These floral explosions celebrate Japan’s four seasons – Spring (Haru), Summer (Natsu), Autumn (Aki) and Winter (Fuyu). Each season’s beauty and individuality is represented in the different colourways. Ranging from the kaleidoscope of vivid bloom colours that represent Spring, to the quiet solitude of the monochromatic palette that shapes Winter, Seasons celebrates the lovely uniqueness and personality of Japans natural landscape throughout the year. Great Wave Bloom is inspired by “The Great Wave off Kanagawa.” This is an iconic image that has repeatedly made an appearance throughout the Ukiyo-e art movement. Hence, it came to represent exploration and an increase of travel during the late Edo Period. The piece appears from afar as a gorgeous blue bloom. However, in detail it pays homage to the original wood-block print, featuring wild seas, boats with fishermen and mountain scapes. 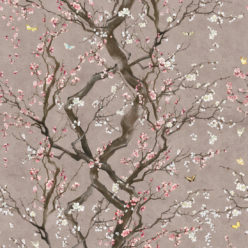 This Japanese floral wallpaper celebrates an intermingling between the stunning Japanese art of Ikebanaa (flower arrangement) and a tribute to the beauty of Japanese culture and art. 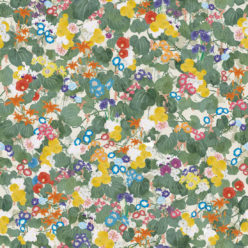 The Yashinoki Wallpaper has a unique design influenced by the natural structured beauty and exceptional diversity of Japanese flora. It features oversized fruitful banana palms and an array of smaller floral arrangements. 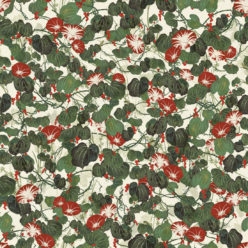 Yashinoki can satisfy the interior desires of the tropical wallpaper or jungle wallpaper seeker but with an eastern twist. 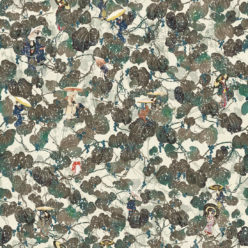 It is inspired by Edo period paintings and woodblock prints, both aesthetically and conceptually. In Japan, the Plum Blossom are admired and cherished for their natural beauty and symbolic significance. The flowers begin to bloom in February signifying the beginning of Spring and the commencement of the renowned plum blossom festival. 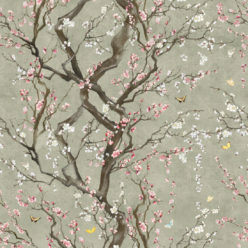 This design captures the plum blossom in its most lively form. It can transform any interior into a plum blossom oasis. 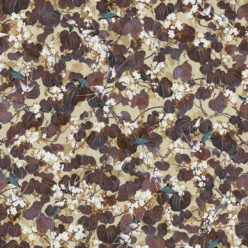 This floral wallpaper comes in four gorgeous colourways: Gold, Lavender, Peacock and Silver. The Ukiyo-e wallpaper collection designed by Kingdom Home is a beautiful and exotic collection that we are proud to offer at Milton & King. Japanese art and culture has so much to offer to the art world and it is so rich in history. Whether you have a love of Japanese decor or are just looking for something truly unique, you are sure to find something you love in these six new designs. Dive deeper into this collection below.